Jill Seidner Interior Design: Blog Series: "This is the story of..."
Blog Series: "This is the story of..."
Early Signs: Since I can remember, I have been drawing furniture plans and houses. 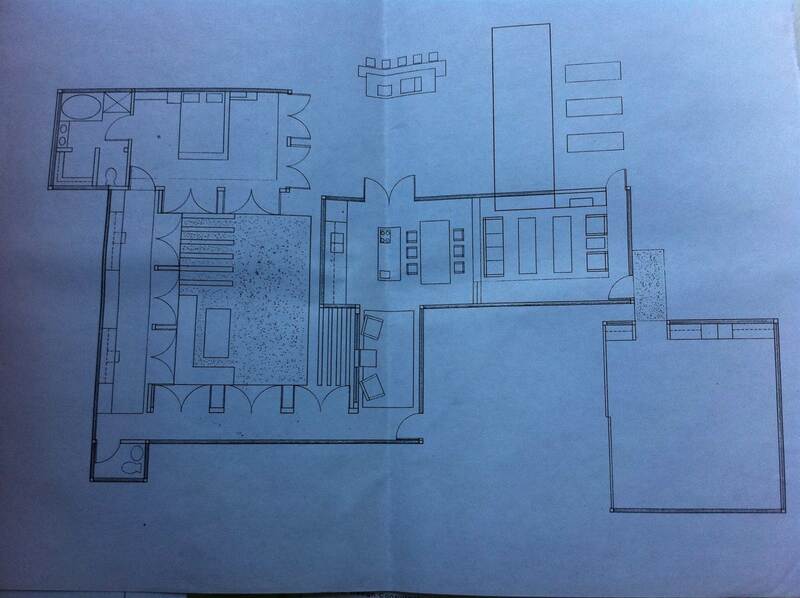 While other kids in school were drawing stick figures, I would draw floor plans and layouts of houses. When we got to play with clay and play-doh in school, I used to mold it into rooms complete with furniture. Later on, I started rearranging the furniture in my bedroom. I actually have a letter I wrote (and was hoping to find it for this post, but it wasn't where I thought it might be, so I need to keep searching) - but it was a letter I wrote when I was probably in second or third grade, and I guess we had to write "When I grow up..." and I wrote how I wanted to be an interior designer like my mom. In the letter I listed all the things interior designers do (looking back, I actually can't believe I knew some of the things I wrote!). I guess when you grow up with a mom working at her drafting board (until late at night, which is what I remember!) - you learn these things! Education: When I was in high school, I decided to spend a summer attending a pre-college program at Otis/Parsons School of Art & Design (now Otis here in Los Angeles). It was a lot of work for a summer program, but a great experience and an insightful one into the world of design and architecture. I think it greatly impacted my interest in architecture, too. 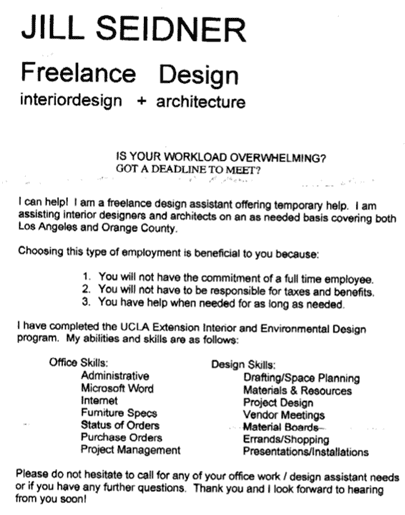 After graduating high school, I attended the UCLA Architecture & Interior Design program. I left UCLA for one semester, to attend the Architecture/Landscape/Interiors program at Otis, and then ultimately came back to UCLA to complete my education. Freelance Design: After completing my education, I decided to market myself as a freelance design assistant to design firms. I created a cover letter (which I faxed out to design firms) marketing my services and setting my freelance rate. This was such a great way of gaining experience, having worked for many different design firms in many different facets of design. I have had the opportunity to work in both commercial and residential interior design firms, design showrooms, large firms and boutique firms, and along the way some very interesting clients (celebs!). I really think for those interested in pursing a career in interior design that taking some time (whether in school or after graduating) to work in different areas of design, possibly as a freelancer, is extraordinarily beneficial. Along the way I learned a lot, made a great deal of connections, and developed relationships with other designers. On my own: Eventually there came a time to go out on my own, and start my own design business. I think for me it was a very natural progression. It sort of came about when one of the designer's I was working for had slowed down a bit. I listed a profile on Guru.com and my first few projects came in (a client remodeling her bathroom in Santa Monica, a florist retail shop in Orange County). Soon I discovered I was taking on more projects and continuing to freelance a few day's a week. As I got busier, I decided I needed more time to focus on my projects and ultimately quit working freelance. Happy to be completely on my own now, but it's certainly a lot of work! My days (like Emily mentioned too) are very long - from early morning meetings to late client evening meetings, to running around in between, to catching up on emails and the "real design work" begins late in the day or night. However, I enjoy being on my own, working for myself, being responsible for everything that comes with running one's own business, and the rewards of a project completed. I also enjoy the process and most of all the learning. Each and every day I seem to learn something new, from blogs to research to subs to vendors to even my clients (whom share experiences with me too!). And to our readers: If you enjoy interior design, there are so many opportunities and arenas of design that you can work in. I would encourage an education (especially to learn about art history, color, and drawing in addition to the technical/business aspects of design) but also to gain work experience (it's really the vocational aspect of working that you really learn hand's on). And I think for the pros and cons, Emily listed it the best, here. And lastly, social media: It wasn't around when I first started, but it is now and it's a huge advantage, to interact with people on a level like never before. Before I started blogging on the Material Girls blog, I was not very familiar with the blog world. So much has changed; I now have a whole new community of blogger and twitter friends! I hope you'll find my there, too! "Come & knock on our door"